How do you revitalise a sleepy historical village that’s off the beaten track? Paulo and Carmen Romão from Casas do Côro have made a huge difference to Marialva by buying up several traditional granite cottages and renovating them to form a luxury rural retreat. They haven’t taken over the entire village so even if you’re not staying there, you can still explore the cobbled streets of what was once a strategically important border settlement and is now one of Portugal’s Aldeias Historicas (Historical Villages). As historical villages go, Marialva is small so it won’t take you long to locate its treasures which are mainly stone buildings and artefacts. Even so, it’s best to head straight for the tourist information office in front of the castle to pick up a leaflet which tells you what to look for, especially as the information on the plaques inside the citadel has long worn off. Tip: If you’re driving, don’t park up until you’ve passed the primary school on your left. You can park outside the café or, if you want to brave the very narrow streets, continue uphill to the castle. Dating back to Roman times, Marialva has changed hands and name many times over the centuries but most of the surviving buildings outside the citadel are from the 16th century. One of my favourites is Casa do Leão (Lion House), named after the funny-looking stone figure at the top of its staircase. I can only assume it looked more lion-like a few hundred years ago. The pillory gives a strong indication of how influential Marialva was in its heyday. Apparently, the more steps a pillory has, the more powerful its village was. Marialva’s pillory racks up an impressive eight steps. Just around the corner, there’s the cute little Chapel of Our Lady of Lourdes. The first time I visited Marialva, I arrived in the evening and didn’t get chance to go through the castle gate. Arriving just before lunchtime on my return visit, I was worried I’d miss out again. Luckily the person manning the ticket office was happy to leave the gate open while they went for lunch at 12.30. The imposing but ruined building to the left of the main gate was originally the old Town Hall, doubling as the courthouse and jail. I wonder how the village children attending primary school there in the 19th and 20th centuries felt about the place. Tucked away behind the looming watchtower are two rather incongruous churches, their architectural features reflecting the more modern times when they were built. Even more modern is the village cemetery; the flowers and smooth gravestones proving that it’s still in use, although it might be better if people didn’t just dump their used flowerpots and water bottles by the wall. Behind the watchtower and Town Hall lies the former square with its pillory, well and patterned paving, best viewed from a higher point, like the battlements. Tip: Wear sensible shoes. The paths are uneven, rocky and sandy and you don’t want to risk losing your footing if you’re clambering over rocks or teetering along the battlements. You can peer into the grounds of the Casas do Côro complex from the battlements, just as you can see the castle when lounging by the pool. If you can afford to actually stay there, you’re in for a real treat. The whole place is geared towards providing refined comfort which starts with a very warm welcome. Each of the refurbished cottages provide unique, tasteful and sumptuously decorated accommodation, whether you choose to stay in a hotel room, a suite or a whole villa. Just remember to take note of which cottage you’re staying in as it’s easy to get lost, especially at night! The curtained beds by the pool and in secluded spots around the grounds offer some privacy in shared spaces and the chance to sleep under the stars although you’ll probably want to keep the hot tub experience to yourself and your nearest and dearest. Although there are other places to stay in and around Marialva, there are no restaurants in the village so you can drive to a restaurant in Mêda to eat or, stock up on supplies and cook your own dinner or treat yourself to exquisite fine dining on site. It will also give you the chance to sample the Casas do Côro wine. This is a popular retreat for Portugal’s rich and famous so you may want to pack your good clothes. If not, the high-fashion leggy waitresses may be better dressed than you are, although the more mature servers have a relatively sedate uniform. I was fortunate enough to stay at Casas do Côro as a guest of the Douro e Estrela project. If you prefer something more down to earth, if a little further away, you could try the cosy family atmosphere of Quinta de Pero Martins (from 55 euros). Marialva (see where it is on Google Maps) happens to be handily placed for exploring the Douro valley as well as the Paleolithic rock engravings in nearby Foz Côa. It’s not far from the dramatic rocky landscape of Faia Brava Nature Reserve and Douro Natural Parks if you fancy hiking. As it was one of the former border towns between Portugal and Spain, you’ll also find other historical villages in the area if you feel the need for more ruined castles and historical villages. Didn’t know that about the steps on pillories, so thanks! 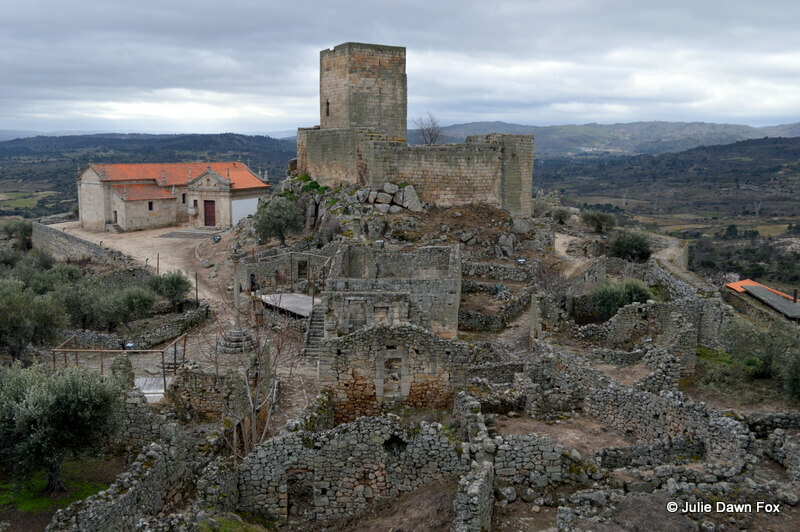 We visited Marialva and a number of other similar villages during our memorable two week tour of north east/central Portugal last Sept. My friend wrote a summary of our trip. See link below. Surprisingly, ‘fancy’ accommodation is not expensive in rural Portugal and there are some wonderful places to stay in with knowledgeable hosts..Some serve food also which was always delicious. So if you’re thinking about visiting Sami, I’d really encourage you to go! Hi Brid, I can’t see the link but I’m glad you enjoyed your tour. It’s a beautiful and varied part of the country with plenty of history and traditions. Lovely village, glad those historical villages are being salvaged. Staying in Casas do Coro, must be quite an experience, the place looks very fancy. Hi Sami, I admit to feeling quite scruffy when I was there, especially compared to the glamorous staff but it was a really lovely place and although it’s rather elegant in many respects, it’s also very relaxing and a great place to treat yourself to.